Compensation of the state's real estate professionals is competitive with the nation's, and there is plenty of room for the number of Texas brokers and managers to grow. And, people who use real estate professional services are willing to pay more for experienced real estate professionals. 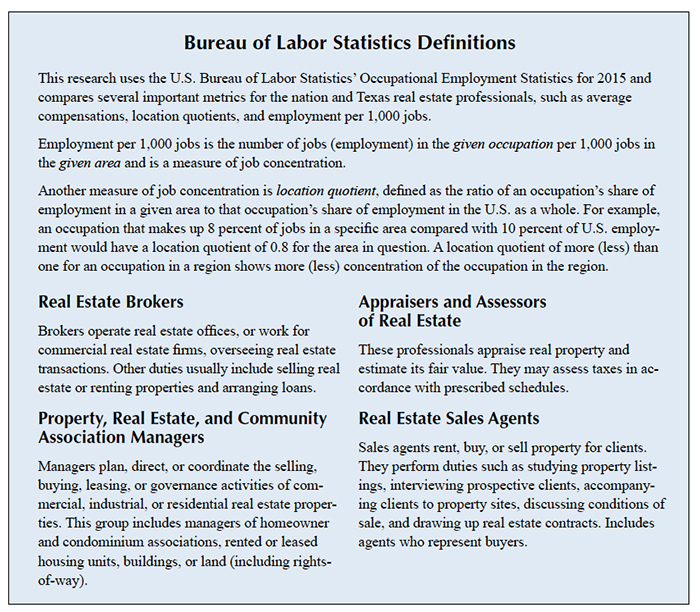 According to the Bureau of Labor Statistics (BLS), real estate professionals fall into four groups: real estate brokers; property, real estate and community association managers; appraisers and assessors of real estate; and real estate sales agents (see sidebar). BLS occupational employment data are collected from reporting firms excluding self-employed. The statistics are samples and actual numbers are higher than the number responding to the BLS survey. Texas was one of the states with the highest brokerage employment in 2015 (Table 1). The number of brokers per 1,000 Texas jobs was 0.21, lowest among states with the highest employment level in this occupation. A location quotient of 0.75 for brokers in Texas in 2015 indicates less than the national average concentration in the broker occupation. 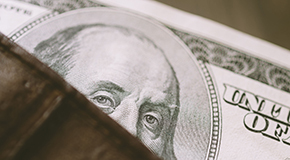 While employment per 1,000 jobs and location quotient were lower than the national average, the average annual compensation of $106,120 for Texas brokers was higher than the national average as well as other states with higher employment. Dallas-Plano-Irving and Houston-The Woodlands-Sugar Land are among the nation's metropolitan areas with the highest employment and highest compensations for brokers (Table 2). Texas ranked third in the number of real estate professionals in the property, real estate, and community association managers class in 2015 after California and Florida (Table 3). Employment per 1,000 jobs and location quotient for Texas for this occupation in 2015 were lower than the national average (Table 3). Average annual compensation for the state's property, real estate, and community association managers was $89,250, higher than the $68,240 national average and topped only by New York. Dallas and Houston were among the U.S. metro areas with the highest employment in this category (Table 4). Dallas ranked first in annual average compensation for property, real estate, and community association managers, followed by New York and Houston (Table 4). Texas had the largest number of appraisers of all U.S. states in 2015 (Table 5). Employment per 1,000 jobs and the location quotient for this class of real estate professionals both were higher than the national average (Table 5). 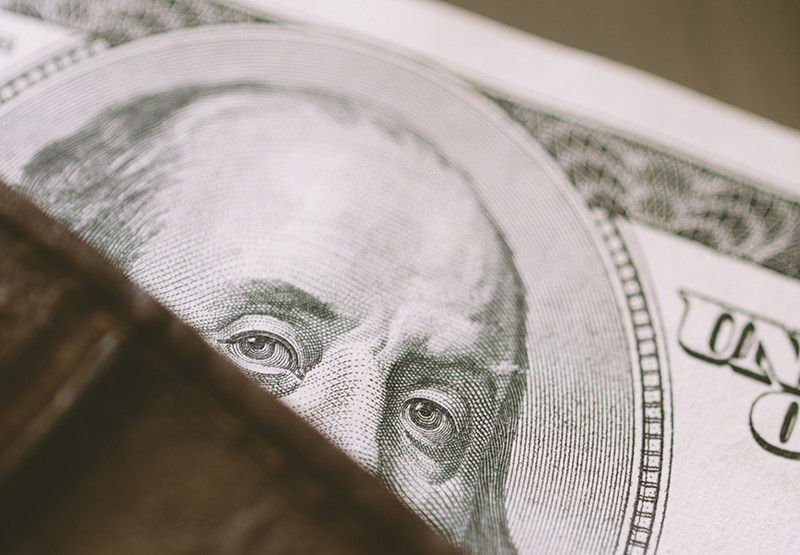 The average annual compensation of $65,340 for Texas appraisers and assessors of real estate was higher than the national average of $58,400 and second only to California. Dallas ranked second after Los Angeles in average annual compensation for appraisers and assessors among the nation's metro areas with the highest number of jobs in this category (Table 6). Dallas had more appraisers than Houston as well as a higher location quotient and more appraisers per 1,000 jobs (Table 6). Texas had the second largest number of sales agents after Florida among the states with the highest employment in this class of real estate professionals (Table 7). The number of real estate sales agents per 1,000 jobs and the location quotient for Texas for this category in 2015 were higher than the corresponding national averages. The average annual compensation of $68,410 for the state's sales agents was higher than the national average as well as averages of other states with high employment level in this group (Table 7). The Houston metro area had the highest number of sales agents after New York and Atlanta. Houston ranked third in annual compensation for real estate sales agents after New York and Chicago (Table 8). Oscar Wilde said, "Experience is simply the name we give our mistakes." In real estate, professionals' experience can help minimize costly mistakes in terms of money and time. Prospective buyers, sellers, and renters search for properties to be purchased, sold, or rented. These searches are costly and time consuming, but real estate professionals can minimize costs and time by collecting, compiling, and organizing property information. People who use them value the knowledge and experience of real estate professionals and are willing to pay more for them. Research shows the value of experience can be measured by the ratio of experienced professional compensation to that of entry level. Users of real estate professionals pay as much as two to three times more for experienced professionals (Table 9).